One of the best ways to immerse yourself in another culture is to get involved in the community and volunteer your time to helping others. Whether you teach English to elementary school children, work at a local hospital, give tours of your new town, or find another way to get involved, you'll experience your time abroad in a whole new way. Need help choosing the perfect study abroad program? We are here to help! Call our Student Advisory Center at (800) 727-2437 or email studyabroad@aifs.com. AIFS offers both Semester and Summer Service Learning and Community Engagement Programs . 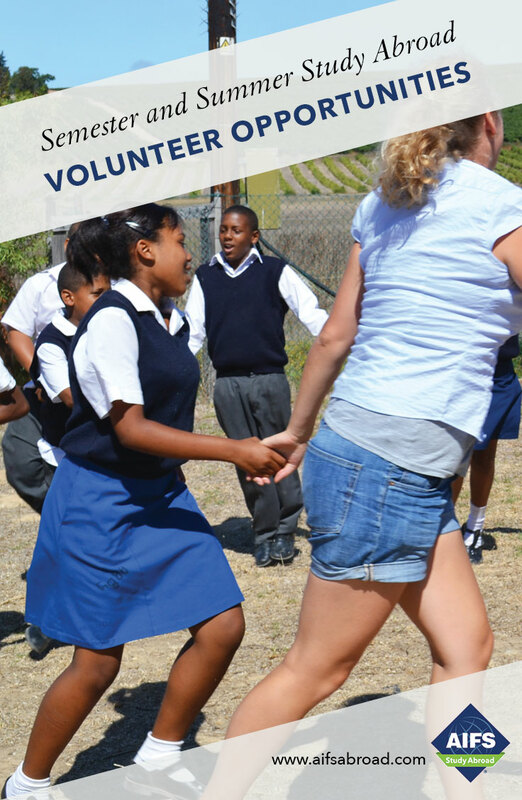 Volunteer opportunities are also offered at various program locations. Students can earn 3 credits working with local students in a French high school. Students choose two courses from the Traditional Academic Program SIP course listings or the regular university courses. 3-credit course combines a service placement with research and training which includes learning about the issues impacting the community. Students work with University faculty and local organizations on a project focusing on an area of need within the community. 3-credit course combining a community placement with written work and based on the principles of civic engagement, ethical social responsibility and social justice. Victoria Plus is a free service-learning oriented extra-curricular program which improves leadership, social responsibility and employability skills. Students take a mandatory 9-credit service learning course plus one or two cthe Full Curriculum Program. This course primarily focuses on work with school children who are from backgrounds of abject poverty. On the Spanish with Service Learning Program students take Intensive Spanish Language alongside 60 hours of working in the local community with placements in the fields of health, science and technology, education, ecology and the environment. The program combines a community placement at a Refugee Center with written work allowing students to learn more about one of the major issues of the day, gain valuable life skills and experience and contribute to the community. The objective of this exciting module is to provide international students with the opportunity to demonstrate their global citizenship through a service learning experience.